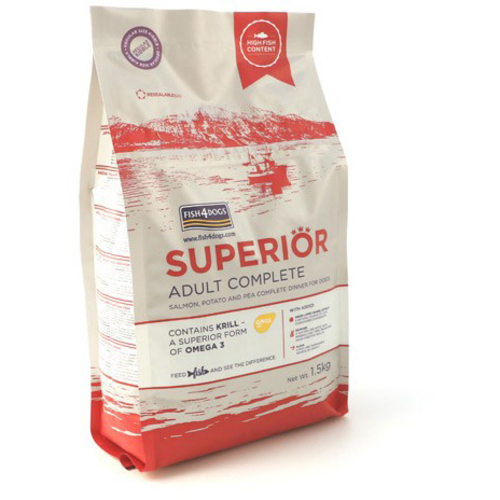 Fish4Dogs Superior Adult Complete Small Bite Dog Food is a delicious blend of salmon, potatoes and peas served as a dry food for dogs. All the very best of fish enhanced with select marine nutritional supplements. Containing a natural source of the joint aids Glucosamine and Chondroitin from green-lipped mussels that have been harvested in New Zealands Marlborough Sounds. Plus added pre-biotic fibres and natural minerals from Norwegian seaweed meal, which supports digestive health. Fish4Dogs Superior also supports eye vision, bone growth and the immune system with added anti-oxidants and natural sources of iron.